As soon as Scarface “falls asleep,” the Ventriloquist brings out his sock puppet, Mr. Buttons. Moments later, the wall of Arnold Wesker’s cell explodes, “waking” Scarface. The Riddler had miscalculated his escape bomb. Scarface thinks Wesker is trying to replace him with Mr. Buttons, so he decides he has to take something from Wesker to prove who is in control. As the Riddler prepares to leave via a bedsheet parachute, Scarface clocks Riddler over the head and avails himself of the Riddler’s escape route. When Batman and Robin arrive, the Riddler informs them of Scarface’s threats against Wesker’s family. Knowing Wesker’s only family is a mob family, they spring into action. When they arrive at the family mansion, Scarface and the Ventriloquist are already shooting up the place. The Dynamic duo tangle with armed family members, while Scarface leads Wesker upstairs. Scarface knows the only family Wesker ever cared about was is mother. Batman hears shots coming from upstairs, and runs to intervene. When he arrives, he sees the Ventriloquist has shot Scarface in the head, thus wounding his own hand. Wesker admits his mother died years ago, and a photo was all that was left of her. Scarface ripped the photo to shreds, so Wesker repaid Scarface in kind. Not a bad little story. Ty Templeton did well. 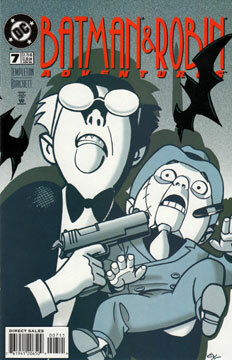 I tend to have a soft spot for Ventriloquist stories, especially when they play off the duality of him and Scarface. Ultimately, this wasn’t much than a drawn out chase scene, but it was fun just the same. Rick Burchett does well, displaying some great energy. His Scarface head is a little weird (those jowls are HUGE! ), but that can be forgiven. This works best when placed between BTAS and TNBA. Glad to see this series of reviews continuing. I’m glad I’m not the only one to enjoy the dcau. Thanks, Sam! The best of these don’t get old.